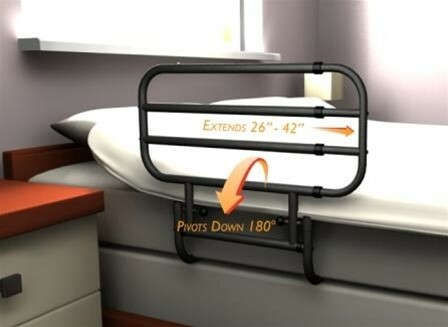 Provides a secure handle for pulling oneself up out of bed. Handle is steel construction and has a rubberized grip for security. Invacare Home Care Bed In A Bag Sheet Set 50/50 Cotton/Poly Home Care Bed In A Bag Sheet Set 661EBBCB The Invacare 100% Cotton Home Care Bed-in-A-Bag is made of 100% premium cotton. Each set includes a jersey knit fitted bottom sheet, a flat top sheet, a pillowcase, and a cotton blend thermal blanket. Quality nylon strap construction with durably sewn seams. Adjustable length adjusts for variable mattress sizes. Contoured buckle provides easy attachment to bed. Cushioned grip handles provides comfortable gripping surface. Strap length is adjustable up to 45 inches. Grip length is 36 inches. Handle grip is 5 inches. Weight capacity up to 300 pounds.